ETA: Thanks for your comments, everyone! They are much appreciated. 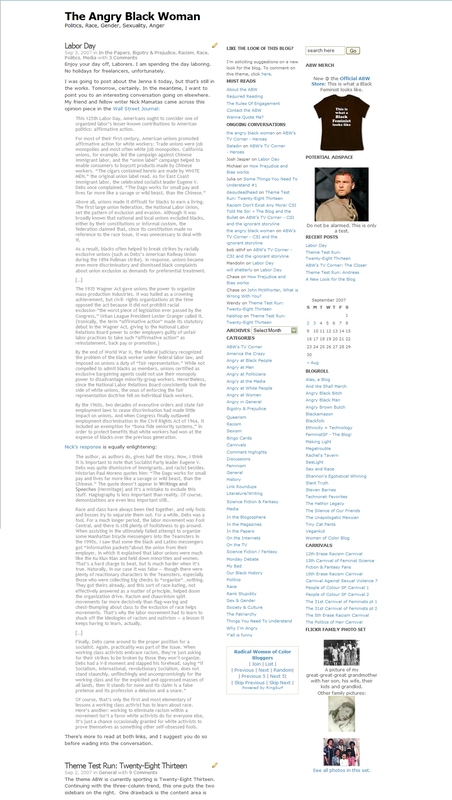 If you’d like to see what the blog looked like with the Garland theme, see this screenshot. You can still comment on this theme if you like, but to comment on the theme currently in use, see the link in the “Like the look of this blog” area on the sidebar. Another 3 column theme. This one has customizable colors so you might see that element change over the next few days while I tweak. The layout isn’t too cluttered and there’s demarcation of the different elements — header, sidebars, content. Variable width middle! But again we’re back to the fact that it doesn’t have much personality. This may continue to be a problem until I break down and start investigating server space. Still, I’ve put in a request for WordPress to upload a few themes I like. We’ll see how that goes. So, what do you think of Garland? Suggestions and comments, as always, are appreciated. This is my favorite of the new ones you’ve tested so far. A little bland, yes, but readable. Is it possible to get rid of the gray bar over the middle column? I think it would look better without it, although I could be wrong. This isn’t bad at all! I still kind of like the red bar on top of the theme you showed us a couple of themes ago. This is pretty good. Though, right now my browser is not maximized and the middle column with the actual content is so skinny that there are 2-3 words per line. I don’t imagine that would be a problem in general, though. It’s fine when I maximize the window. I like this one. The different shades for each section keep it neat. I like this one, too. It’s easier to read because of the shading, and I like it better with a bar on each side, rather than two bars on the right, like the last test theme was (I think). I agree – best so far. It may be possible, if I purchase the ability to customize my CSS. which, looking at my choices, is most likely what I’ll have to do. I am favorable to this theme, but it needs tweaking. The links need to default bold for folks who are colorblind, the headers of the sidebar widgets need to be not so big – they look weird that big. the sidebar text needs to be smaller by a point or two, though I like the text size in the main area. And yes, I want to get rid of that bar and scope out the possibility of putting an image at the top. I like it too, but can you make it change the colour on used links? I didn’t think to try that on the previous ones. I hope it’s not a WordPress feature that I can’t see where I’ve been. Otherwise, with the changes you mentioned it would be great. Oh, I like this one :) The subtle colour change between columns works nicely for me. Although, my eyes are kind of wigging out at the red text … but I don’t know if it’s because I’ve been staring at a screen too long or because it’s genuinely weird. best one so far. the last one was enough to make even me swear off 2 right hand sidebars, though the fixed width & plainness was probably the real culprit. New theme looks good, but would be curious to see what it looks like without the gray bar in the middle section banner. I like the gradient look and it’s blocking the effect some. Are you toying with the idea of adding ads? I’ve given some thought myself, but haven’t decided yet.